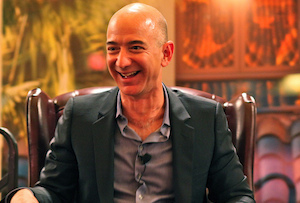 Jeff Bezos' extremely ambitious baby is far more than just an ecommerce company. Amazon is nothing if not ambitious. Not content with being the world’s largest ecommerce company and global numero uno in cloud computing, the Seattle supremo has set its sights on besting Microsoft and Google to become the work email provider of choice. Amazon WorkMail is being sold as the uber-secure option, the implication being neither the NSA nor GCHQ, nor indeed China, will be able to get through its encryption. That sell is no doubt helped by the fact the Seattle-based company hasn’t been as battered by privacy concerns as fellow tech giants. ‘Lots of questions have been raised about US companies’ relations to the NSA and the federal government and their stance towards subpoenas, and Amazon hasn’t been as battered by the documents that came from Mr Snowden as Microsoft and Google have been,’ Forrester analyst T J Keitt told the FT. The cloud-based email and calendar service is also compatible with Microsoft Outlook and ‘native iOS and Android applications’ (i.e. Gmail), so users apparently won’t actually have to change how they work. WorkMail will be run from the Amazon Work Services division, which made an estimated $4bn last year. And that has some pretty spiffy credentials: customers such as the CIA, Netflix and NASA and a 27% share of the cloud infrastructure market worldwide, way ahead of Microsoft, on 10%, IBM and then Google. Whether that will convince business customers to move their email on over is another question. It’s newer ventures have had mixed success: Amazon’s in-house studio may be Golden Globe winning but its Fire smartphone has pretty well flopped. Meanwhile, investors are getting increasingly fed up with Jeff Bezos’ obsession with investing in new projects instead of regularly turning a profit. Their eyes will be firmly on full year results out later today.